As America's baby boomers age, more and more are developing dangerous health conditions such as diabetes that necessitate the use of medical ID tags. Lauren's Hope medical alert bracelet jewelry gives a generation attractive incentives to display potentially life-saving information. 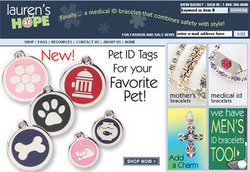 A LaurensHope.com fashion medical ID bracelet melds function with fun. Baby boomers with potentially life-threatening health conditions can make a statement in more ways than one with jewelry that marries function with fashion. Medical ID bracelet maker Lauren's Hope is using style enhancements such as beadwork, leathers, watch faces and 14 karat gold to make IDs more appealing to seniors and people with chronic medical conditions whose lives may depend on displaying medical data for first responders. Lauren's Hope medical ID emergency alert jewelry creators Denise Gaskill and LeAnn Carlson hope to encourage more seniors to display valuable health information by creating medical alert tags that are attractive and customized to the wearer. For example, older males with diabetes who are hesitant to don a traditional metal ID might be more receptive to mens leather medical alert bracelets or metal bracelets that reflect their personal sense of style. "Our medical jewelry speaks for you when you can't," co-owner LeAnn Carlson said. "If you have a medical condition such as diabetes, asthma, severe allergies or a heart condition, it is important that you wear identification to alert emergency personnel in the event that you are unable to communicate." The interchangeable ID tags include men's, women's and children's medical bracelets, which can be customized for any medical condition and bracelet preference. Baby boomers can even wax nostalgic about the fashion of their youth with one of Lauren's Hope's new products: the color-changing, or "mood" bead, fashion medical ID bracelet. Other ID choices include medical ID dogtags, pendants, engraved guitar picks and cuff bracelets. 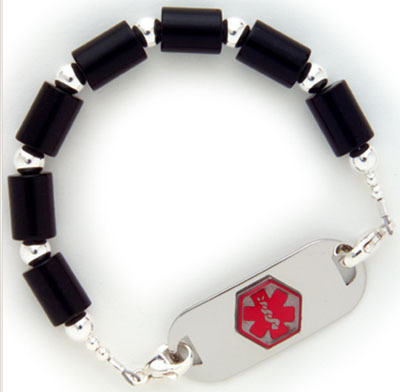 For men who must wear a medical bracelet, leather, sterling silver and other attractive materials are available. "If you had to wear the same medical ID bracelet every day you probably wouldn't want to wear the same bracelet with every outfit," Lauren's Hope co-owner Denise Gaskill said. "The beauty of our bracelets is that you have one medial ID tag that is engraved with your important medical information, but you can purchase an unlimited number of bracelets to interchange with the tag." For more information about Lauren's Hope, or to order fashionable medical ID bracelets, charms and tags for women, or mens leather medical alert bracelets, visit LaurensHope.com. Lauren's Hope was founded by Denise Gaskill and LeAnn Carlson as You Name It in 1994. The Kansas City, Missouri, based company started out selling personalized children's gifts and mother's bracelets. In 2001, inspired by then-12-year-old Lauren Philips, a diabetic, the company introduced a successful new product, Lauren's Hope for a Cure Medical ID Bracelets, and changed its name to Lauren's Hope. 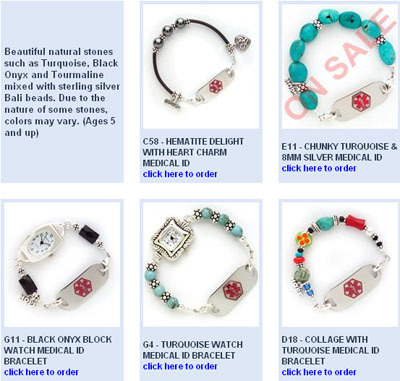 The company now offers individuals with diabetes, allergies and other medical conditions a diverse line of women's stylish medical ID bracelets and attractive mens leather medical alert bracelets and metal bracelets at LaurensHope.com. Lauren's Hope men's medical alert braceletMens leather medical alert bracelets and metal bracelets are available at LaurensHope.com. Lauren's Hope medical ID'sEverything from mood beads to gold to natural stone is available at LaurensHope.com.